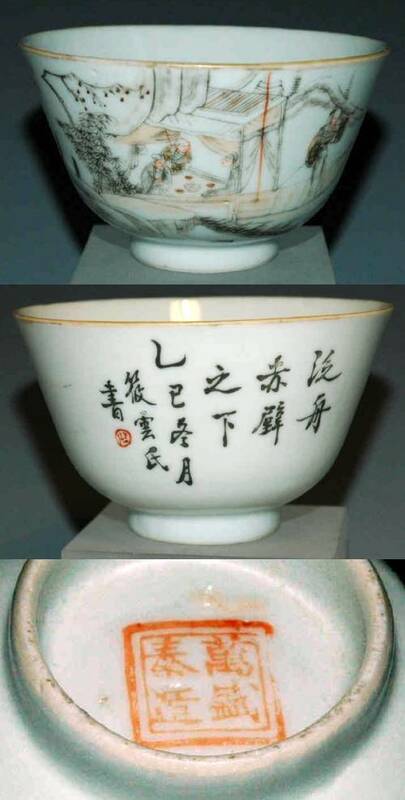 This is an on-going research project which list Chinese cyclical dates as they appear in inscriptions on Chinese porcelain from the late Qing dynasty and into the 20th century. Chinese dates are cyclical and recur every 60th year. Without a reference to the reigning Emperor, it is possible to by mistake date a piece 60 years back or forward in time. This table can be used for finding out the Gregorian calendar equivalent of Chinese cyclical dates but is intended to show what the cyclical dates actually looks like when found in the calligraphy. To read the table, find the "heavenly stem" character in the left column, like jia (1), then search for the appropriate earthly branch character in the horizontal row, like chen (5). In the cross section you will find the cyclical year jia chen which shows the date within each 60 years cycle. In the table below are some of the years - according to the Gregorian calendar - that fits with the cyclical years. To expand the list, just add "60" to the years to find next fit to the cyclical year as in 1740, 1800, 1860, 1920 and so on, will all have the same cyclical date. In the table is also included the zodiacal signs for the full cycle. Anyone born in 1952 for example will be a "dragon" with the element of "water" and so on. This page has been created together with expert members of the Gotheborg Discussion Board with a special thank you to Simon Ng in Hong Kong, and N K Koh, in Singapore. Pictures and pieces that makes up this section besides those that belongs to the Gotheborg.com reference collection have been donated by Simon Ng, City University of Hong Kong; N K Koh, Singapore; Hans Mueller, USA; Bill Thurnbull, Canada; Hans Slager, The Nederland and Tony Jalin Zhang, Beijing and many more. Some items are lifted from the Gotheborg Discussion Board dated porcelain section and added here for public access. I am grateful for any corrections or further translations you can submit. Any actual dated porcelain pieces or pictures thereof that you think might make a fitting addition to this section can be offered to me via email to Jan-Erik Nilsson. This page is a work in progress aimed to create a reliable chronology for the porcelain produced during the end of the 19th century up until the Republic Period of China. Web page © Jan-Erik Nilsson, 2004.